Last week I was given a wonderful mole inspired spice rub from my brother Lupe, aka @2bridgesflavor , who makes the best best jerky I've ever had. The flavors and spices used are excellent, I recommend following him to get more information and updates on what he is working on. When I first got the rub, the aroma is what struck me. There were so many different complex notes in it that I knew it was going to be good. You can get the chocolate, nutty and chile notes indicative of mole while being fresh and vibrant. Immediately I thought of doing spice-rubbed chicken legs. To begin I put a generous amount of the the rub all over every surface of the legs to make sure they were completely covered. The rub spread easily and it was nice to able ot distinguish some chili flakes and sesame seeds which will show nicely in the end result. 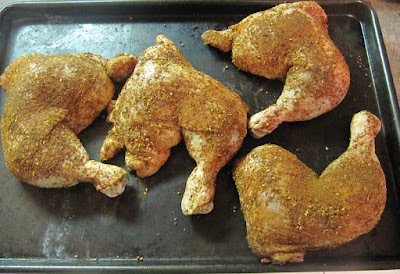 I placed the chicken legs in the oven at 375F for about an hour. As the chicken cooked this amazing smell was coming from the oven as the spices warmed and melded with the roasting chicken. I took the chicken out and immediately noticed that a beautiful crust had formed. The outside of the chicken was crisp and had an amazing color to it. It was hard not to rip of a piece and have a try. The chicken took well to the spices and it worked wonderfully to create the end result. To serve the chicken, I made a bit of crisp, oven-roasted kale that I had coated in a bit of the chicken fat that had rendered from the roast. I proceeded to make sort of a quick pickle of roasted carrot and fennel tossed in lime juice and a touch of honey to round it out. 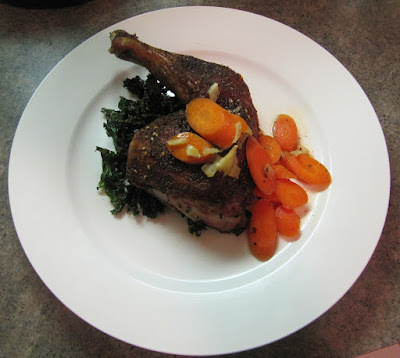 I placed the chicken on a bed of kale and spooned some of the carrots with the lime juice and fennel on top. The final dish was amazing, the flavors of the spices really shined through and tied all the components together. 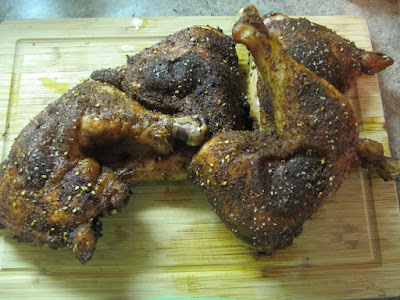 I was really impressed by and excited about this spice rub and I can't wait to see more from @2bridgesflavor . Great write up and great pics...I'm working on another spice blend/rub. I'll get it to you soon, thanks again, man!